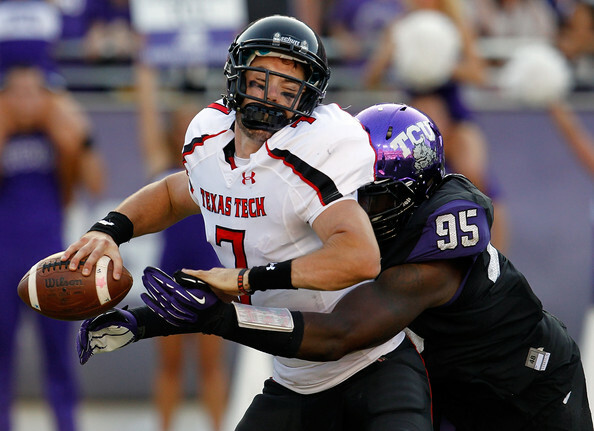 TCU's Devonte Fields made life miserable for Big 12 quarterbacks in 2012. Offense is king in America's heartland, and the Big 12 features some of college football's most explosive attacks. Seven of the conference's 10 teams (Baylor, Kansas State, Oklahoma State, Oklahoma, Texas, Texas Tech and West Virginia) ranked in the top-25 nationally for scoring offense, but does anybody play enough defense to win a national championship? That will certainly be the big question for conference contenders this season, and with quarterback questions at Oklahoma, WVU and Kansas State, several offenses could take steps back as well. The conference may not have a bona-fide national favorite, but only Kansas looks like a lost cause, with nine teams all chasing a bowl game. Mike Gundy and Oklahoma State put an exclamation point on their 2012 season, smashing Purdue 58-14 in the Heart of Dallas Bowl. The Cowboys seemed to be letting off some steam after finishing the regular season 7-5, with three of those losses coming by a score or less. While senior quarterback Clint Chelf got to do the majority of the Boiler bashing in the bowl game, the Pokies return another signal caller that has started and won Big 12 games. After the messy transfer of quarterback Wes Lunt, sophomore J.W. Walsh figures to give Chelf a run for the starting position. But, no matter who wins the competition, Okie State should again have one of the nation's best offenses. Things aren't quite as rosy over in Norman, where Bob Stoops enters his 14th season with the Sooners having to replace the program's all-time winningest quarterback, Jason White. Still, junior Blake Bell is a former five-star prospect that has experience as a goal line runner and "wildcat" type of weapon. He'll battle fellow dual-threat quarterbacks Trevor Knight and Kendal Thompson for the starting job, but it remains to be seen if offensive coordinator Josh Heupel (A former OU QB under Stoops himself) will change the offense to match his quarterbacks' strengths. Make or Break Year for Texas? Since playing in the 2009 BCS Championship Game against Alabama, Mack Brown's Texas squads have underachieved while trying to become more like that Crimson Tide team that defeated them. Brown brought in Bryan Harsin to build him an SEC-style power running offense, but the Longhorns had previously enjoyed a tremendous amount of success running the spread in the early to mid 2000s. Clearly, the experiment didn't work out. Now former Texas quarterback Major Applewhite is back in Austin trying to bring that electric spread offense back. Texas has the talent in place on offense, with Mike Davis and Jaxon Shiplet returning at receiver, and former five-star running back Johnathan Gray entering his first season as the starter. The question will be the consistency of quarterback David Ash. As a sophomore in 2012, Ash was benched four times, but returning his top two receivers and all five offensive linemen should help Ash feel comfortable. On defense there is good news and bad news. The good news is Texas returns nine starts on defense. The bad news is that last year's Longhorn defense was the worst in school history, surrendering a school record 5,244 yards. It was so bad that as many as four starters could be replaced by younger players, and if Mack Brown can't get this thing figured out, Texas will again end up in the middle of the conference. With his massive salary and several other mediocre seasons in the rearview mirror, Texas could show Brown the door if his team doesn't deliver this year. Baylor served as the ultimate microcosm of the Big 12 as a whole last year, finishing second in the nation in total offense, but second to last in total defense. It sure made the Bears fun to watch, but replacing Nick Florence (Who set school records in his one year replacing Heisman winner Robert Griffin III) will not be easy. Look for junior Bryce Petty, a tall, strong armed gun slinger, to get the first look, but defensive improvement will be key if Baylor hopes to contend in the Big 12. Texas Tech lost coach Tommy Tuberville, who inexplicably chose to leave a major conference Texas school for an AAC team in Cincinnati. It was an odd move, but fans in Lubbock were somewhat disenchanted with Tuberville after a sub-.500 conference season. Enter former Red Raider quarterback Kliff Kingsbury, who spent last season as Johnny Football's offensive coordinator at Texas A&M. Kingsbury is considered one of the best young offensive minds in the country, and sophomore quarterback Michael Brewster should be the beneficiary. Tech was actually decent on defense (By Big 12 standards), but new defensive coordinator Matt Wallerstedt is looking to change the team's base defense from a 4-3 to a 3-4 in hopes of getting more speed on the field. Don't expect the Red Raiders to seriously contend this season, but they seem to have the right fit at head coach, both strategically and culturally. Oh, you thought I forgot about this Texas school? Quite the opposite, actually, as the Horned Frogs seemed poise for a big year in 2013. The schedule starts off brutally, against LSU at Cowboys Stadium (One of two games without suspended star pass rusher Davonte Fields), and TCU will face other conference contenders Oklahoma, Oklahoma State and Kansas State all on the road. They do get a break by not having to face Texas, but the schedule is a bear by anyone's standards. Still, this isn't about the schedule, it's about the Horned Frogs, who return five starters on offense, plus 2011 leading passer Casey Pachall, 2011 leading rusher Waymon James and talented tight end Stephen Bryant. James and Bryant both missed last year with injuries, but Pachall missed TCU's final nine games to get treatment for his substance abuse issues. If Pachall and James can return to their 2011 form, it should greatly improve a TCU offense that was pedestrian in 2012. A more explosive offense will go a long way, but TCU has always hung its hat on defense under head coach Gary Patterson. The Horned Frogs led the conference in total defense a year ago, and return nine starters on that side of the ball. Look for the secondary, led by All American corner Jason Verrett, to be a strength. Devonte Fields (So. ), DE, TCU. Lache Seastrunk (Jr.), RB, Baylor. Josh Stewart (Jr.), WR, Oklahoma St. The secondary should be the strength of TCU's defense, but Fields might be its best player. 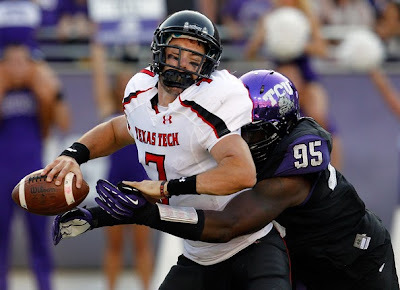 After a 10 sack, 18.5 TFL 2012 that earned him Big 12 Defensive Player of the Year honors, Fields returns with hopes of taking TCU to the next level, even if he will be suspended for the first two games of the season. Oh, and did we mention he's only a sophomore? While Baylor's passing game gets all the attention in Waco, Seastrunk ties that whole offense together. Seastrunk's vision, pass protecting and receiving skills make him the perfect fit in coach Art Briles' Air Raid attack, and he should top last season's 1,000 yard rushing total this year. Stewart hopes to follow in the footsteps of former Cowboy receivers Dez Bryant and Justin Blackmon on the field (Though, perhaps not off of it), and the speedy inside receiver has the talent to do so. While considerably smaller than Okie State's last two great pass catchers, Stewart is water bug quick with great hands, and is a threat to score any time he touches the ball. 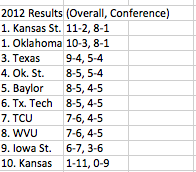 Here is how I see the Big 12 shaking out this season. This upcoming season the big story for the Big 12 is quarterbacks. Geno Smith, Collin Klein, and Landry Jones are all gone. David Ash of Texas will start the season with the most career starts at a paltry 18. The new quarterback class is nowhere near the talent level of the last few years. Five years ago, the Big 12 featured Sam Bradford, Robert Griffin III, Colt McCoy, Chase Daniel, Graham Harrell, Todd Reesing, and Josh Freeman. Bryce Petty, quarterback of the Baylor Bears, appears to have the most hype going into the new season. When you add the speed of their running back Lache Seastrunk, you may have a more potent offense than RG3 had during his Heisman winning campaign. TCU suffered from too many freshman on the field last year, but it may pay off this season. They have a lot riding on their opening game against LSU in their backyard at AT&T Stadium. Casey Pachall is back from his drug counseling suspension and will be looking to impress. Coach Mack Brown will start the season on the hot seat at Texas. 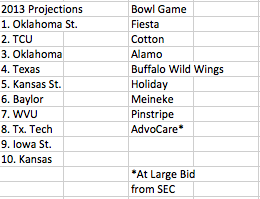 A mercy bid to the Valero Alamo Bowl will not cut it this season. They have 19 returning starters so they could be a surprise to most. Oklahoma’s Belldozer experiment at quarterback will be something to see. Blake Bell will move from short yardage people-mover with 24 career rushing TDs, to an every-down quarterback with only 20 career pass attempts. There will be a ton of hype around Kliff Kingsbury's return to Texas Tech as the head coach. He won’t have the team to win many games, but his offense will put up points on everyone.